The fields over which the battles of the Antietam raged are dotted in every direction with graves. These graves are generally very shallow, and it will be difficult hereafter to turn up the soil to any depth without disturbing the bones of those who repose in them. 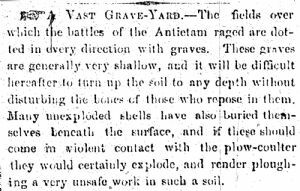 Many unexploded shells have also buried themselves beneath the surface, and if they should come in violent contact with the plow-coulter they would certainly explode, and render ploughing a very unsafe work in such a soil.